VIE is a multilateral Video exchange that enables cross-network video calling and conferencing by securely interconnecting disparate video networks. The XConnect Video Interconnection Exchange (VIE) is a carrier-neutral, multilateral Video Federation that securely interconnects disparate video networks. VIE streamlines the technical and commercial aspects of interconnecting to multiple video networks to provide seamless cross-network video conferencing and calling. 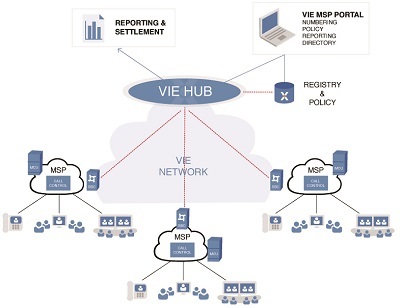 Powered by XConnect’s award winning ENUM Registry and Multimedia Interconnect Hub technology, VIE is accessible Private or high quality Public IP interconnection into one of XConnect’s globally distributed Points of Presence. ENUM Registry: Maps identities, addresses and telephone numbers to video end-points to enable VIE members to discover routing information of video end-points across the VIE network. Interconnect Hub: Mediates the signaling and media between VIE members. Directory: Allows end-users to quickly and easily search and discover the video contact details of other VIE members. Provides a range of flexible clearing and settlement models for video traffic between VIE members.